"Goddam, do I love strawberry pocky!" As previously mentioned (and judging by this blog's second highest traffic day ever), one of the biggest events from this year's New York Comic Con was the premier of footage from and Q&A with creators and cast of AMC's The Walking Dead comic-to-television adaptation. Of the two people I attended NYCC with, one was busy during the screening and the other doesn't care for zombies. Wait. What? Who? Who doesn't care for zombies? I have another friend who couldn't attend the con and he ended up being sent the first two episodes before the cast so that he could properly interview them because this is his job and TWD is just. That. Big. 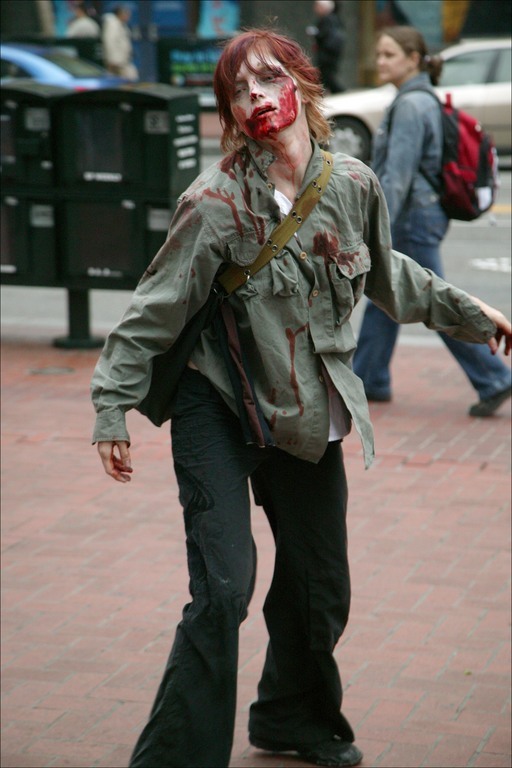 Really, with a ghoul so iconic, so simple, so terrifyingly Other and yet Us, how can you not love zombies? They're like if Edward Said decided one day to go mad and slaughter Western civilization until the survivors properly understood Orientalism and The Exile. Zombies don't make mistakes. They don't get cocky. They plod through a continent doing what they do. They are a natural purge of artificiality in human existence. How can you not love zombies? The only people who don't love zombies are people who aren't afraid of other people. Now there's two sides to that. Am I saying that nerds who love zombies are all terrified of dealing with mainstream society, large groups of people and even the other human beings they're forced to interact with by the sheer coincidence of living in the same geographic region? Sorry, guys. I'm one of you, I really am, and if we want to look at it from the other direction, it sounds much better to say, "The few people who don't like zombies are likely comfortable with who they are, how they deal with society at large and/or have much more pressing worries than in which Walmart they will hole-up when the inevitable happens." It's possible that they're just really focused on other parts of their lives. Maybe they're even too dumb to see why a writhing, unidirectional mass of self-destructive conformity is a bad thing. That actually sounds like a really great way to think about it. But no, most likely they're just not frightened by the notion of going out and coping with human beings every morning. Which is a pretty weird thought, really.